Are you guys always on the hunt for simple, quick dinner recipes that the entire family will love?? I AM!! We have our classic recipes that we make all the time, but I’m usually desperate to change things up and find new recipes the whole family will enjoy. That’s easier said than done with five kids, but we recently found a new recipe to add into the rotation that was a hit with everyone. 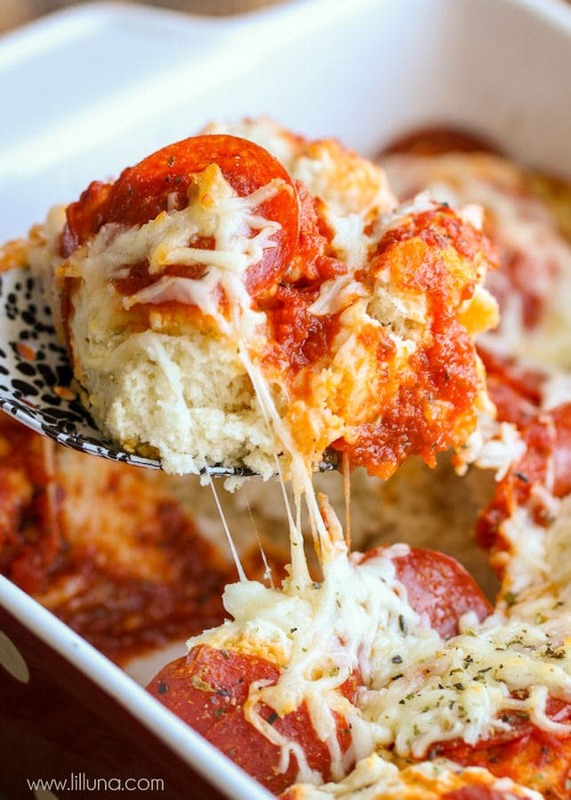 That recipe is Deep Dish Mini Pizzas. Bite sized pizza… Do I need to say anything more? 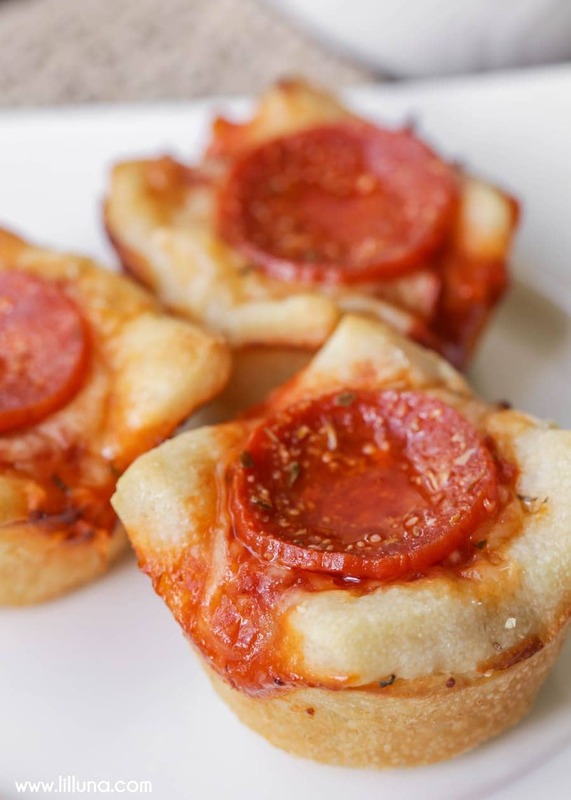 These deep dish mini pizzas were simple to put together and the perfect finger food for all! I love that you can be creative with this and change it up as you please. In place of pepperonis, you can add sausage, jalapenos, or ham and pineapple – the possibilities are endless. This recipe is also great for the kids to help out with. 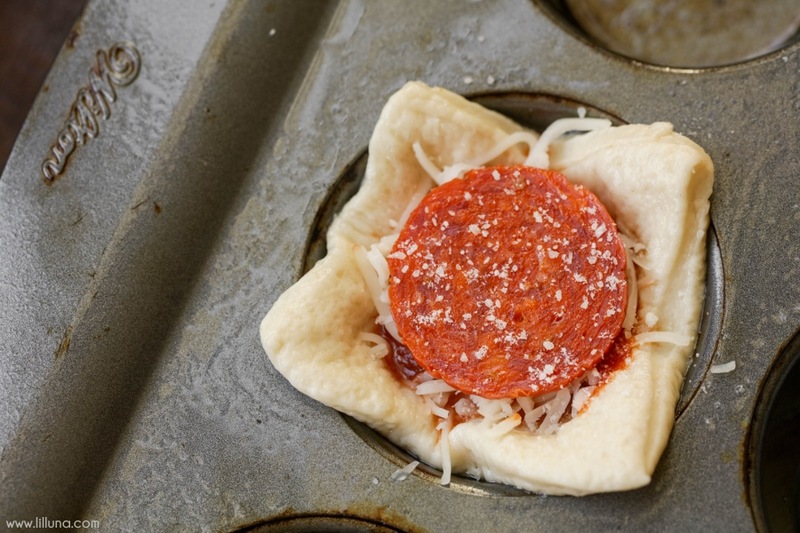 They love making regular pizzas, so custom mini pizzas for each kid would be great to make!! 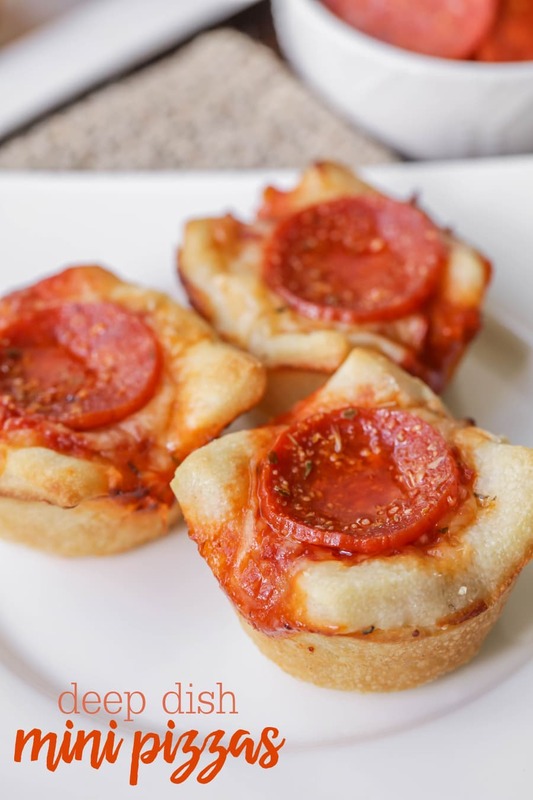 Deep Dish Mini Pizzas - our new favorite dinner recipe. They're easy, quick and can be made custom for each person with their favorite toppings! Unroll pizza dough onto a lightly floured cutting board. Cut into 12 (3x2-inch) rectangles. 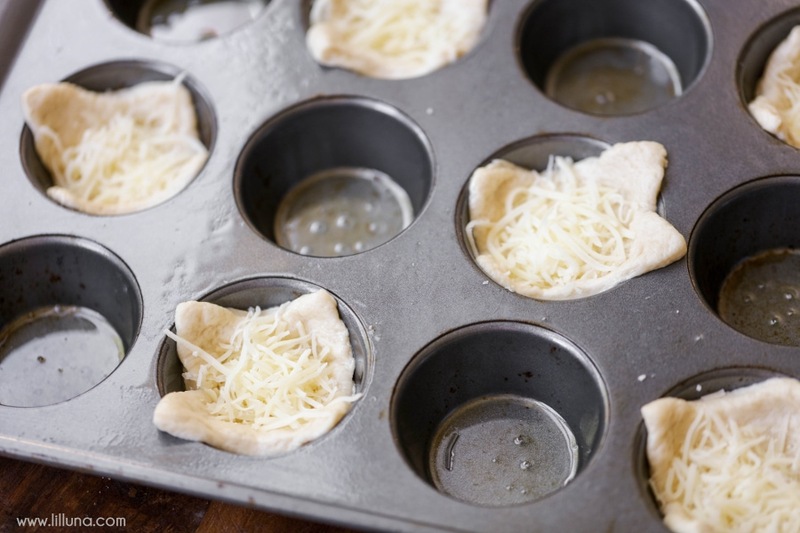 Grease a mini muffin pan and place 1 dough piece in each cup. 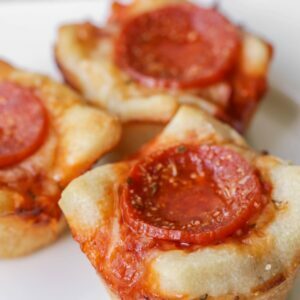 Sprinkle half the shredded cheese into the cups; top with pizza sauce, remaining shredded cheese and pepperoni. 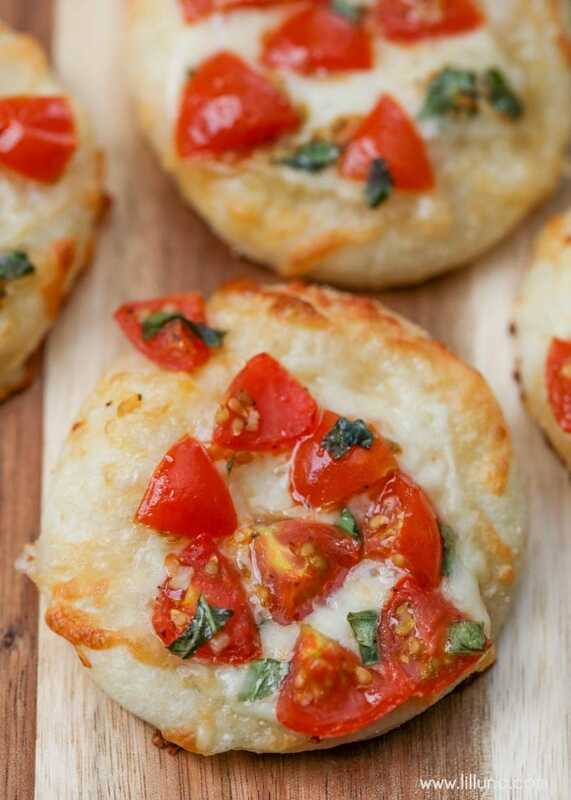 Sprinkle with Parmesan and oregano and bake for 11-12 minutes or until golden brown. We will definitely be making these more often because they were so simple, quick and perfect for an easy dinner idea. Plus, we usually have most of the ingredients on hand which totally helps!! For all recipes on the site be sure to go HERE. I would really like to make these. What temperature do you bake them at? Thank you! I followed the directions as written, including the use of the mini muffin pan which I believe are all created equal. I even measured the size of the dough pieces as I cut. My aim was to make 24 of these, so I purchased double the ingredients. Ultimately, I only had to use one tube of dough, the cut pieces of dough hung out of the cups much more than pictured, there was not enough room inside each cup to accommodate all of the fillings, so I have lots of leftover cheese and sauce. The baking time is accurate, but because of the lack of space inside each muffin cup (and I did press down the dough), I got a cheesy mess in my oven because everything ran. I think these could have been tasty but for the size issue. Oh, no..so sorry! I didn’t have that issue. Mine kept shrinking in, so I had to keep pulling the dough at each edge, so it would come out a little bit. I didn’t have the issue of too much ingredients inside, maybe because it was doubled, you added more in each? Just trying to think of how it spilled over. They are tasty, so I hope you’ll give them another try. Thanks so much for trying them! Great idea! 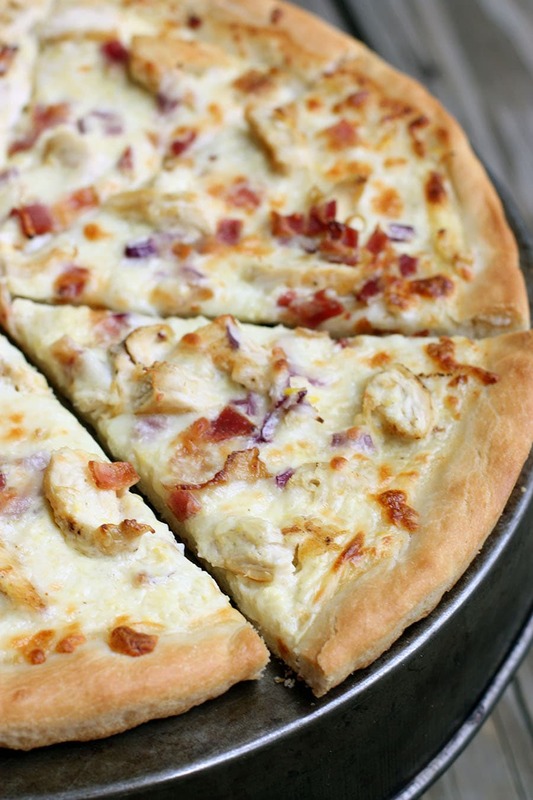 Going to include this in our pizza night rotation!